Referred to as an aristocrat, the Afghan Hounds appearance is one of dignity and aloofness. 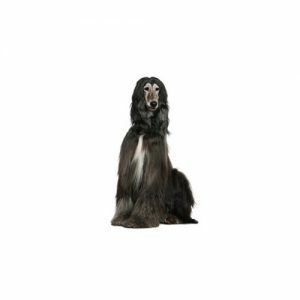 Well covered with thick, silky hair, very fine in texture, the Afghan hounds coat is a sort found among animals native to high altitudes. They can come in all colors, and while the breed is an excellent hound (hunting by sight) its popularity here has been generated by the breeds spectacular qualities as a show dog. The Afghan hound was discovered by the Western World in Afghanistan and surrounding regions during the 19th century. As the breed developed in Afghanistan, two distinct types evolved from the southern and western desert regions and the northern regions. During WWI, the breed literally disappeared in the Western world. The start of the Afghan Hounds we have today dates back to 1920, when a group of them was brought to Scotland. Known for being aloof, dignified, and for having a highly individualized personality, Afghan Hounds are prized and loved by their owners as companions and members of their family. However, it is important to take into account that their coat requires regular grooming, and their larger size necessitates regular exercise. Hound Group; AKC recognized in 1926. Ideal size ranging from 25 to 27 inches tall at the shoulder and 50 to 60 pounds. The Afghan Hound is an aristocrat, his whole appearance one of dignity and aloofness with no trace of plainness or coarseness. He has a straight front, proudly carried head, eyes gazing into the distance as if in memory of ages past. The striking characteristics of the breed-exotic, or “Eastern,” expression, long silky topknot, peculiar coat pattern, very prominent hipbones, large feet, and the impression of a somewhat exaggerated bend in the stifle due to profuse trouserings-stand out clearly, giving the Afghan Hound the appearance of what he is, a king of dogs, that has held true to tradition throughout the ages. Are you interested in purchasing a Afghan Hound?